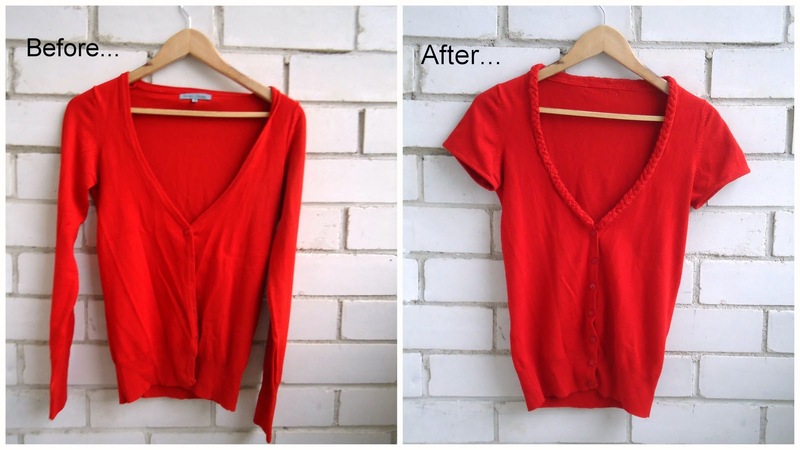 A quick tutorial on re-fashioning a simple cardigan (admit it, we all own at least one!) by turning it into a short-sleeve cardigan with a braid along the neckline. 1. Decide how short you want your sleeves, mark it and cut (photo 1). 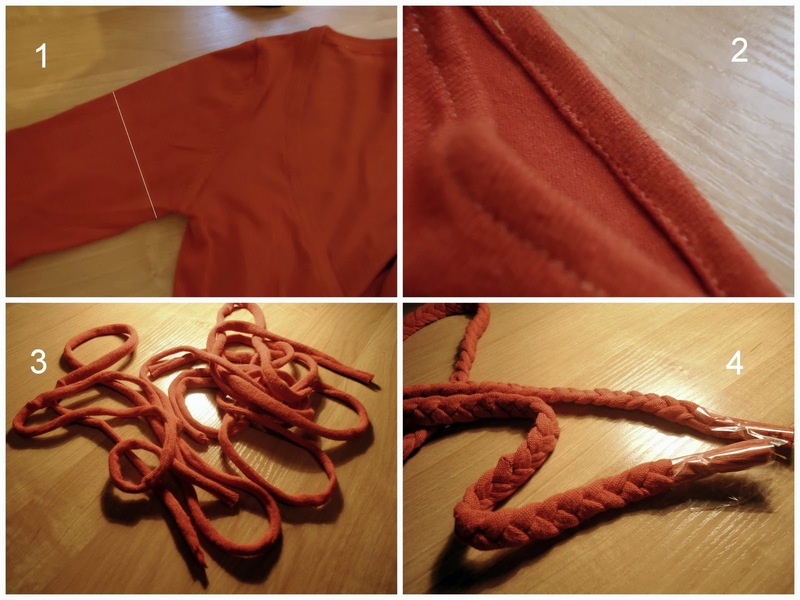 Fold the end of the sleeve and sew, like you see in photo 2. Tipp: if you have problems when it comes to sewing stretchy fabrics (my sewing machine creates wavy seams on stretchy fabrics), put very thin paper underneath (I put newspaper) and sew regularly. 2. 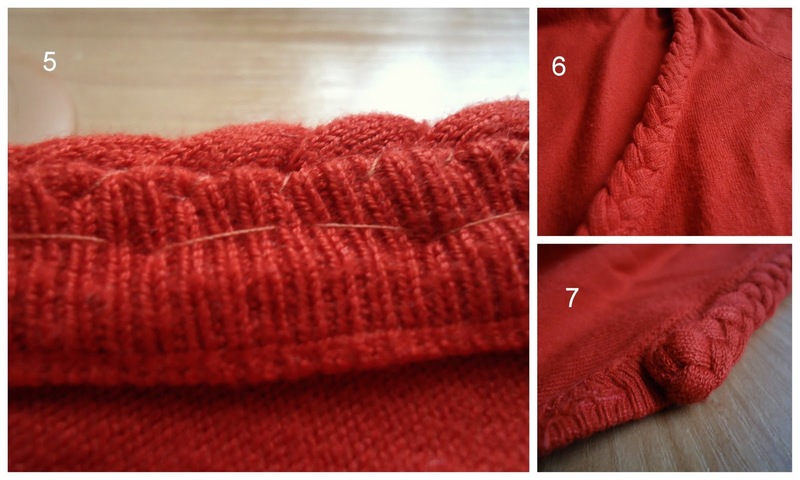 Take the cut-off sleeve, cut the end (don't know how to say it, but cut the part that has different knitting ;D ). Take the remaining part of the cut-off sleeve and cut as many long stripes as you can (stripes should be 2,5 cm (about 1 inch) width). Sew the ends of the stripes so that you have 3 very long stripes. 3. Take one stripe, wrong side facing up, sew the long edge and turn it inside out. Repeat with the remaining 2 stripes (photo 3). Take the stripes and braid nicely (as you see in photo 4, I secured the ends of the braid with tape, but you can secure it in any way you want). 4. Take the braid, put it along the entire neckline and stitch by hand (photo 5). Stitches should not be visible from outside (photo 6). As for the ends, remove the tape (if you used it), push raw ends inside and secure by stitching. Gorgeous! I have a few cardi's that are starting to look a little sad and this will give then a new lease on life (and be summer-friendly). Great idea! Nice recon! You've inspired me to go out and find some cardis to redo. That's very nice to hear, Frumpy2Fabulous!